At 5 foot 11 inches, Gina Miller is long accustomed to walking tall. Now she stands alone, too. Through happenstance and circumstance, Miller has become the last woman sportscaster on the six North Texas TV stations with daily local newscasts. The Dallas native, who went as far as Guam to learn her trade, anchors the weeknight sports segments on TXA21's prime-time newscasts and also teams with Derek Harper on the station's pre-game, halftime and post-game shows. In football season, she shifts to sister station CBS11 to co-host Dallas Cowboys pre-game shows. "I tease her all the time that she should be on ESPN or TNT, says Harper, the former Mavericks guard whom Miller, 34, used to watch as a gangly student at Lakehill Preparatory School. "She's a natural and she's paid her dues . . . Gina's a rock star. When I go places, everybody's like 'How tall is Gina Miller? Is she really as pretty in person as she is on TV? Is she married?' "
For the record, she's divorced and has a boyfriend who wanted to take her out on Valentine's Day. But Miller says she balked because the NBA All-Star game was having its slam dunk and three-point shooting competitions that night. "It's very tough to have a social life. Work definitely dominates my life right now," she says. On this mid-Friday afternoon, Miller is a few hours away from joining Harper for in-studio commentary and analysis on what will be a dispiriting Mavericks road loss to the Houston Rockets. "I hadn't realized I was the only woman doing this," she says. "I really don't think it's a concerted effort on the part of stations. It's just happened sort of naturally that I'm the only woman left." That's been the case since early January, when Fox4 declined to renew the contract of sports anchor/reporter Nita Wiggins. Last year, WFAA8 sports reporter Erin Hawksworth left the station to take a general assignment reporter's job at WFXT-TV in Boston. Neither position has been filled by management, leaving WFAA8 with a four-man sports staff and Fox4 with just a two-man crew. "The economy is to blame as much as anything," Miller says. "They're not replacing these women. They're not replacing the guys either." Miller rode and showed Arabian horses as a kid, but otherwise had no particular interest in competitive sports. That changed when a "hugh growth spurt" shot her up from 5 foot 2 inches to 5 foot 9 inches as a 13-year-old. "I was told, 'You are playing basketball whether you like it or not," she recalls. "I was the tallest girl in the state of Texas. But I was terrible. I mean, I was a horrible basketball player." She got better in the summer between her 9th and 10th grade years, doggedly playing basketball with her grandfather "every single night." But she rebuffed subsequent scholarship offers from the University of Texas at Arlington and the University of Dallas. "I didn't want to stay in Dallas and I really didn't want to play basketball in college," says Miller. Instead, "I wanted to be Bob Ortegel -- bad," she says, referring to the former college basketball coach who's now in his 20th season as the Mavericks' television/radio analyst. "I was obsessed. I really was." Enrolling at the University of Houston, Miller quickly scored an internship with the Houston Rockets. Her duties included handing out game notes and media passes, helping write press releases and FAXing newspaper stories to the team's owner. "It was a tactical move," she says. "I knew that working in PR I would meet a bunch of media people. So any grunt work, I did it. I did it with style." There were other perks. Miller still has an official ring from the Rockets' 1994-'95 NBA championship season. "Everybody asks me, 'Is it your boyfriend's ring?' " she says, laughing. "And I get so upset, because it says 'Miller' right there on the side. We earned those rings." Her media contacts paid off after graduation, when Miller landed a job as an assistant sports producer at Houston's CBS affiliate, KHOU-TV. But she never got on the air, which is where she dearly wanted to be. So Miller answered a trade magazine advertisement -- "Come Work in a Tropical Paradise" -- for KUAM-TV in Guam. She got the job and finally got on camera for the first time in July 1996. "I was in a little over my head," Miller says. As KUAM's sports director, she was expected to shoot, produce, edit and anchor stories on Guam's reigning sports -- fishing, scuba diving, paddling and volleyball. After six months she returned to Dallas and lived at home for a short time. Then came an "out of the blue" call from WBIR-TV in Knoxville, Tenn., where she'd sent a video resume a year earlier. "They decided they wanted to take the leap and have a woman in the market," says Miller, who became the station's weekend sports anchor, producer of its Sunday night sports show and "what ever else they needed" as WBIR's promotable new "Sports Girl." Her beat included the University of Tennessee's Lady Vols basketball team, coached then and now by the legendary Pat Summitt. "She's awesome. I mean, she can be a booger bear, but she was great to me," Miller says. She stayed with WBIR for two-and-a-half years, but was getting homesick. Shortly after her grandfather died, she moved back to Dallas and hasn't left since. Miller and Derek Harper are now a veteran team at TXA21. Miller first landed a job with the Dallas Cowboys SilverStar Network, where for three years she produced the weekly Special Edition with Jerry Jones show while also doing sideline reporting for the team's pre-season games. 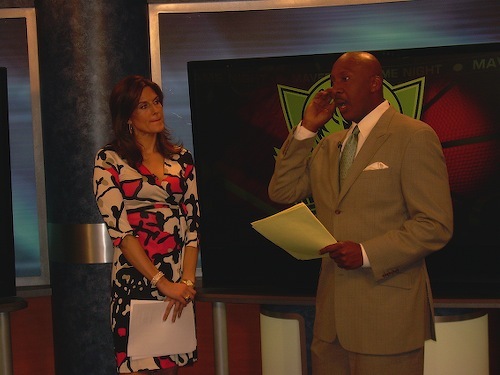 She then moved to WFAA8 in July 2002 as a sports reporter and occasional fill-in anchor. That lasted until October 2005. "I'd been without a contract for a year, and I think I just kind of got lost in the shuffle at Channel 8," Miller says. "I didn't see any room for growth there." Sports anchor Dale Hansen, who hired her, "was very candid with me," she adds. "He said I'd pretty much maxed out my limit." Hansen says he'd very much like to have Miller on Channel 8's team again. "To me she has the classic look for a female sportscaster," he says. "Very attractive but not in a fashion model sense. She was a great reporter and a very good friend, and I hated to see her go. But it was a move she had to make, and I told her so. And if we ever pay more than minimum wage for a reporter again, I'd like to get her back." CBS11 sports anchor Babe Laufenberg says he "initially tried to hire Gina when she went to Channel 8. We didn't have a full-time position at the time, but we got her the second time around. "Her strength is her versatility," he adds. "She wears many hats. We do more with our sports department than any station in the market. So you're not just Super-Glued to an anchor chair reading a TelePrompTer." Miller joined CBS11 and TXA21 just in time for the Mavericks' ill-fated 2005-06 season, which ended with a stunning loss to the Miami Heat in the NBA Finals. "I think they blew an opportunity they may never get back," says Miller, who first teamed with Harper in that season. She can be blunt-spoken when the occasion demands, recently telling viewers from her TXA21 anchor chair that the Mavericks "smelled bad" in a road loss to the cellar-dwelling Oklahoma Thunder. Mavericks owner Mark Cuban, who publicly ripped the team after that loss, says Miller is "smart, professional and obviously knows her stuff." She has a few non-sports interests, too. Miller wouldn't mind being a travel journalist some day. She's also a big fan of Peter Sellers movies and an avid reader of Agatha Christie mystery novels. Christie and athletic pursuits can mix, though. Miller listens to audio readings of her novels while training to complete her first marathon. She warmed up by running the Feb. 28th Cowtown Half-Marathon, which she completed in a time of one hour, 47 minutes and 52 seconds. Miller says she hopes to run the Oklahoma City Memorial Marathon in April, but there could be a catch. "It all depends on Mavericks playoffs scenarios," she says. "Story of of my life, huh?"